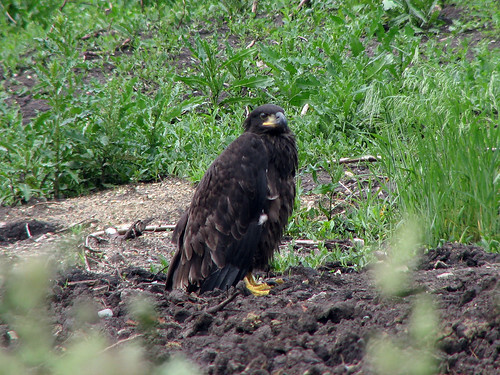 It should come as no surprise to anyone with any familiarity with this blog that my best bird of 2011 is actually a pair of birds: the Mooseheart Bald Eaglets. 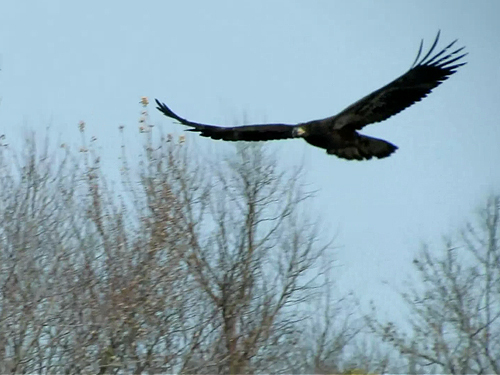 The first baby Bald Eagle flies free! The adventure began back at the end of May, when FCWR became aware of a downed Bald Eagle nest in Mooseheart, Illinois. The race was on to keep the parent Bald Eagles on site and replace the fallen nest, reuniting the baby eagles with their parents. When the parents unfortunately failed to care for the babies in the new, human-made nest, the eaglets were brought back to FCWR for care. Arthur and I helped with their initial enclosure – complete with a new “nest” – but this was only a very tiny part of their time in the care of FCWR. The eaglets were eventually transferred to a new, large flight chamber, where they learned to fly and all of the other skills they would need to be released back into the wild. The release at Starved Rock State Park was magical, and I feel so lucky to have been able to attend as a FCWR volunteer. Both babies flew strong from their release site on Plum Island. If you click through to the older blog posts, you’ll see more photos and video of these beautiful birds. The Mooseheart Eaglets were easily the highlight of my 2011! Mooseheart Bald Eaglets to be released next week! Flint Creek Wildlife Rehabilitation is a non-profit, federally licensed rehab organization with locations in Chicago and Barrington, Illinois. You can follow their blog here, follow them on Facebook here, and make donations online here. This post reflects my own experiences as a volunteer with FCWR. Any errors are purely my own, and opinions here do not necessarily reflect those of FCWR. This entry was posted in FCWR, Festivals & Events, Illinois, Rehabilitation. Bookmark the permalink.